The 1960's looked very promising with big expansion plans in the works. Business had been increasing and Sam himself reported : “1960-61 season was the the finest since he came to the Basin. 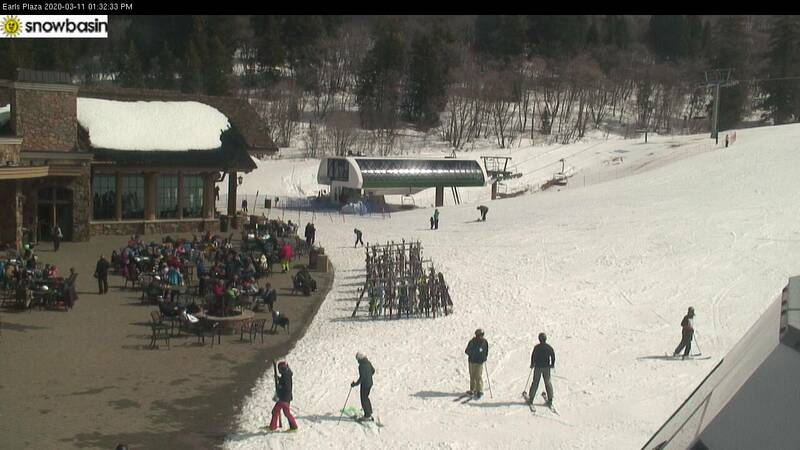 On one day in the past season he had 1,100 paid skiers in Snow Basin... a record”. 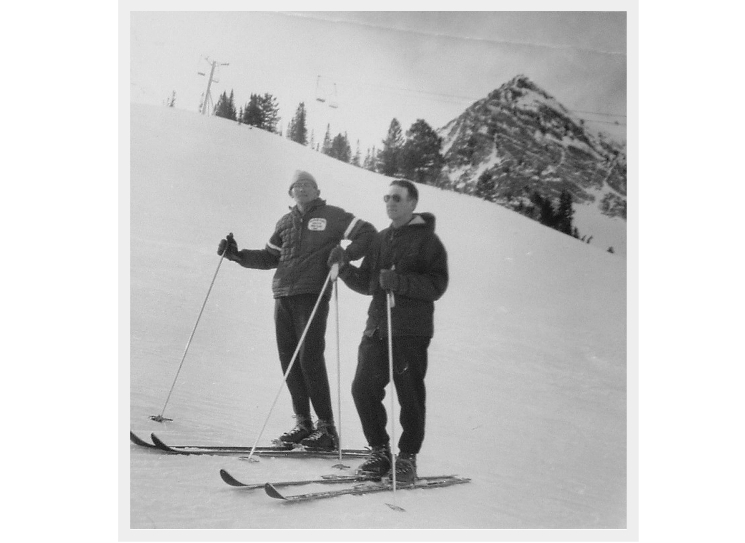 The Ogden City Recreation Ski Program that was sponsored by the Ogden Standard-Examiner was such a huge success that it had a waiting list. There were plans for a new day lodge and several new lifts to be installed in the early years of the 1960's. In the summer of 1961, Dr. Aaron Ross and Rulan Stanfield took over the Forest Service Shelter and gave it a major renovation/expansion. Designed by local architect, Richard D. Lowe. The lodge was built out of stone, glass and timber and was designed so patrons could have an unobstructed view of the great vistas of Snow Basin. Personally, I was in awe of this lodge and how the roof line reached to the sky. There is a home on the south side of the mouth of Little Cottonwood Canyon that reminds me of the Gelande Inn and I always look forward to seeing it when I'm down that way. 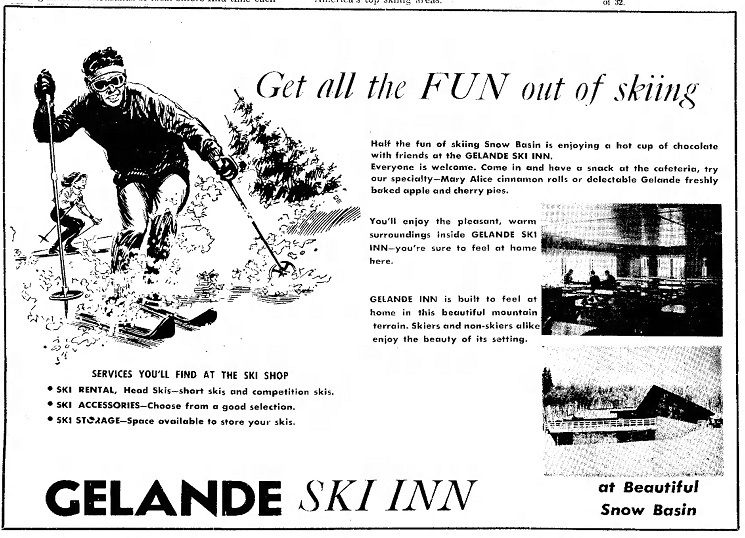 The Gelande Inn was sold to Snow Basin Lift and Development Co. in 1973 and the name was changed to Snow Basin Lodge. When it was expanded in 1979 the architectural attributes were significantly altered in order to be more functional. Finding old photos of the Gelande Inn has been one of the most exciting parts of my blog adventure. 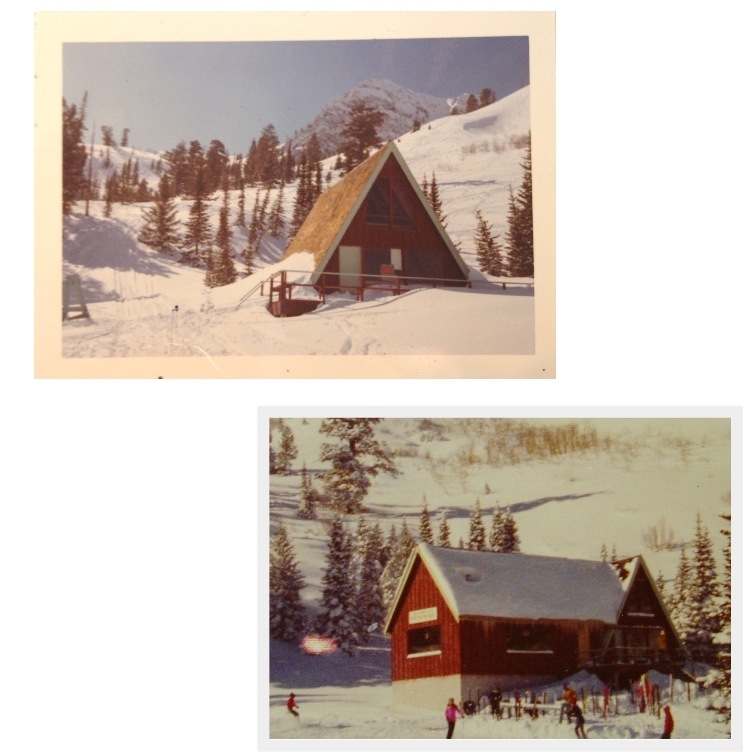 Snow Basin Lodge was used until the 2001-2002 season, when Earl's Lodge officially opened. 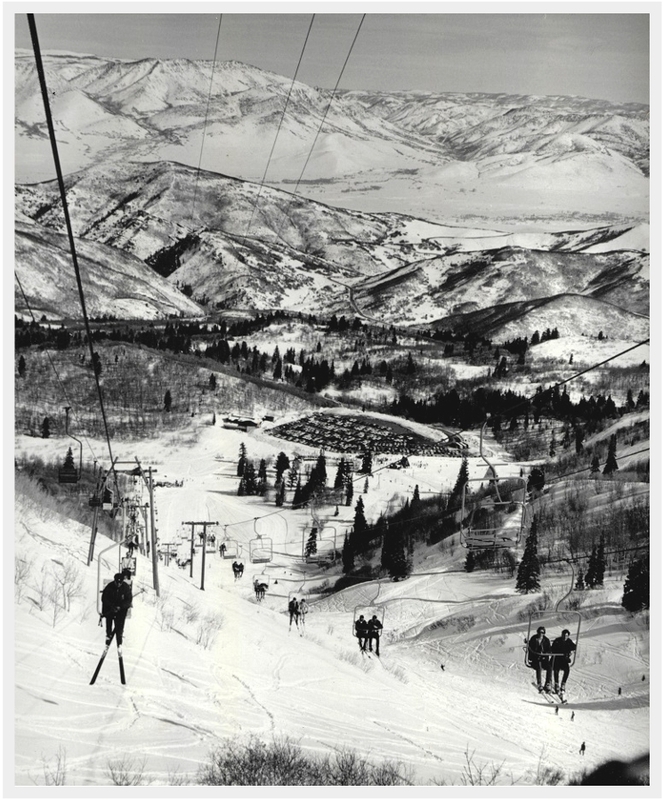 Sam Huntington's second double chair lift in two years opened for the 1961-62 season. The “Porky Double” which replaced the Porcupine tow was 4300 feet long with 1100 vertical rise and carried 700 persons per hour. The base of the lift was in the area now known as H & H Flats. 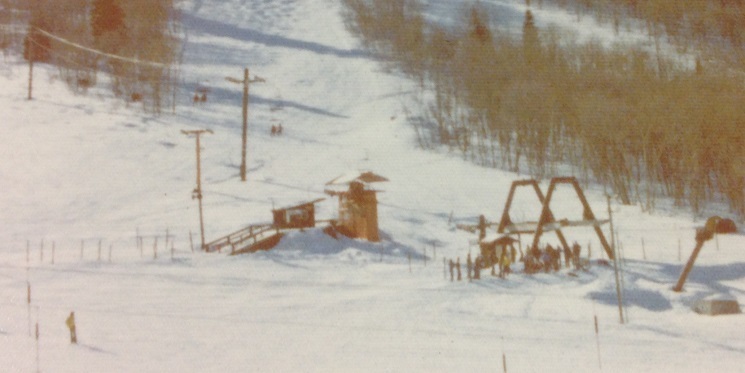 Top: Porcupine lift in the early 1970's. Source: Ralph Johnston Collection. Bottom Left: Porcupine loading station Source: Ogden Standard-Examiner. Bottom Left: Looking south toward Porky Face. Source: Ralph Johnston Collection. The Porcupine double was in operation until the end of the 1986-87 season. 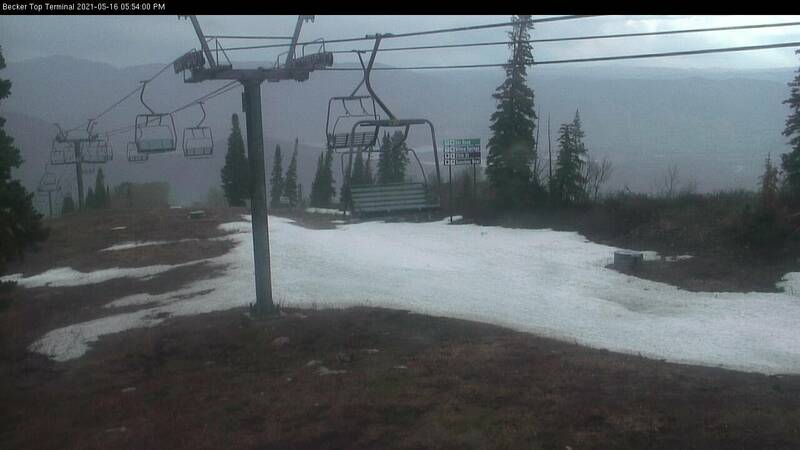 It was replaced by a brand new Triple chair lift and the loading station moved to the bottom of the Becks run. The Huntington room in Earl's Lodge was named in memory of Sam. 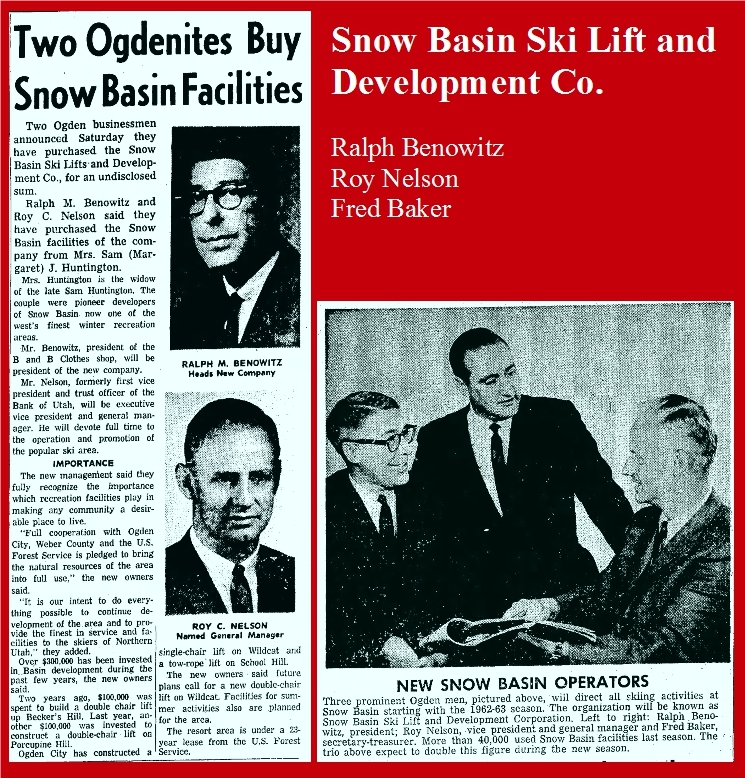 Shortly after Sam's passing three Ogden businessman purchased Snow Basin from Margaret J. Huntington, Sam's wife. Ralph Benowitz, Roy Nelson and Fred Baker. The new owners continued to make improvements and expand the area through the 1960's. One of the first things the new owners did was purchase a Saint Bernard, “Wildflower” as a mascot. They also designed Snow Basin's first official logo, a Saint Bernard riding the Wildcat single chairlift. This classic piece of “folk art” was used from 1962 until the late 1970's. I have been unable to obtain any photographs of Wildflower. If you have one I would be grateful for it. The new owners also had the employees wear a uniform bearing the new logo. For a limited time, Snowbasin Resort is selling throwback T-Shirts, Stickers, Magnets, Coaster, Pins & Hoodies bearing this classic logo. They are available for purchase at the Grizzly Center at Snowbasin Resort. I have fond memories of skiers hanging out on the patio of the Huntington Haus. It was a great spot to take a warming break and grab a hot cocoa. Top: Huntington Haus with Mt. Ogden Peak in the background. Source: Don Wilson. Bottom: The Huntington Haus in the early 1970's with John Paul Jones run in the background. Source: Ralph Johnston Collection. In 1969 the Huntington Haus was expanded to twice the original size. The Huntington Haus was in operation until the mid 1980's when an avalanche slid down John Paul Jones run and did extensive damage. Since the lodge was going to be in the path of the proposed Porcupine triple chair lift, it was torn down rather than repaired. 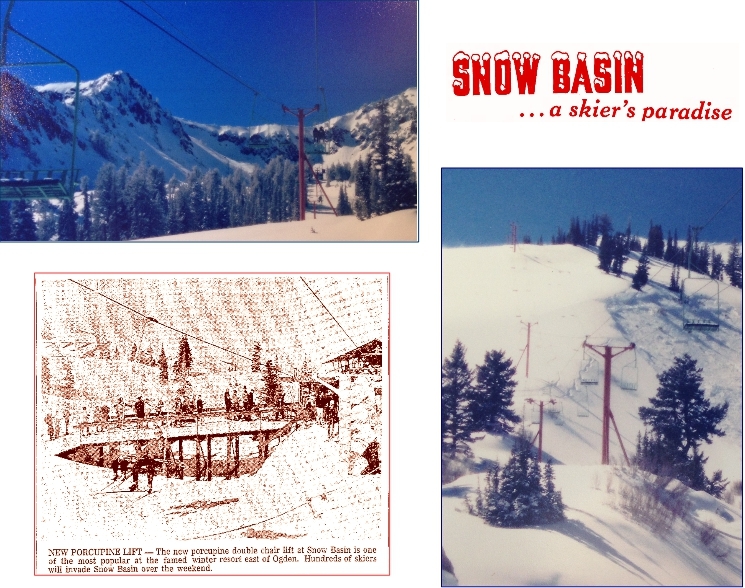 In the summer of 1964 a very much needed second lift was installed next to the Wildcat single chair lift. 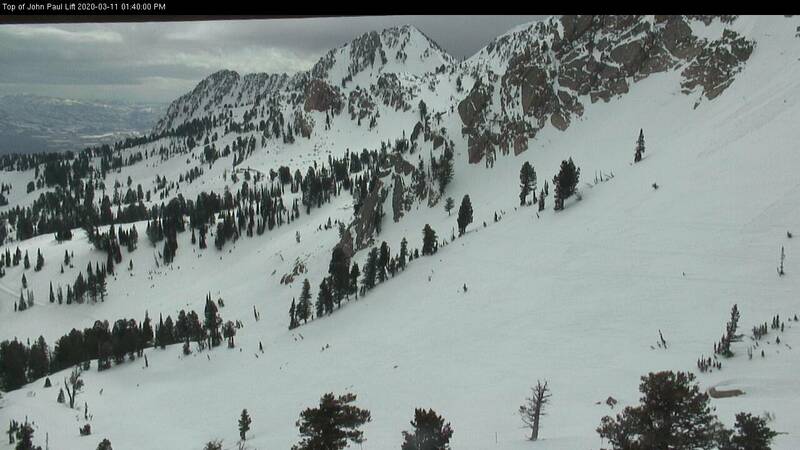 Built and installed by American Cableways Co. of Provo, Utah at a cost of $150,000. The new lift was 5200 feet long and was supported by 16 square steel towers. The new lift could carry 900 passengers per hour as compared to the Wildcat single that could only carry 300 passengers per hour. 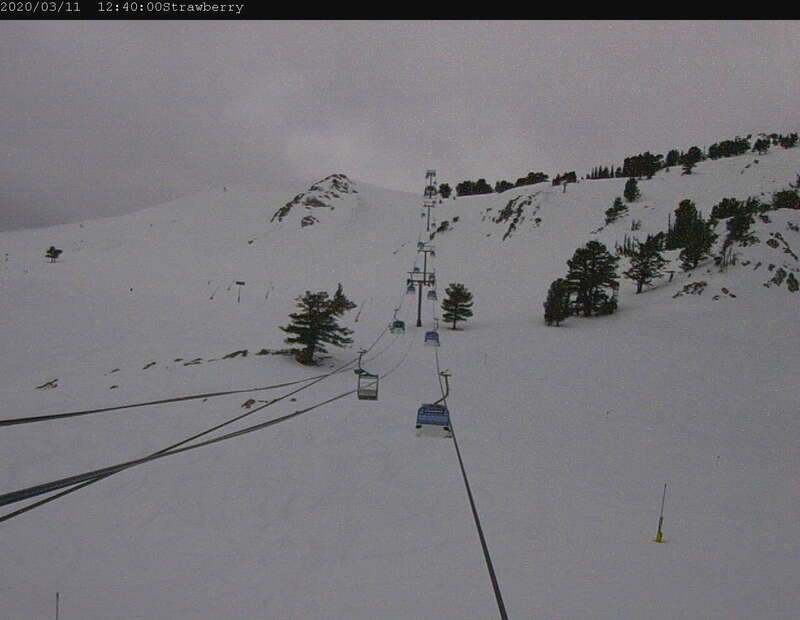 An added safety feature on the new lift were pull down bars. 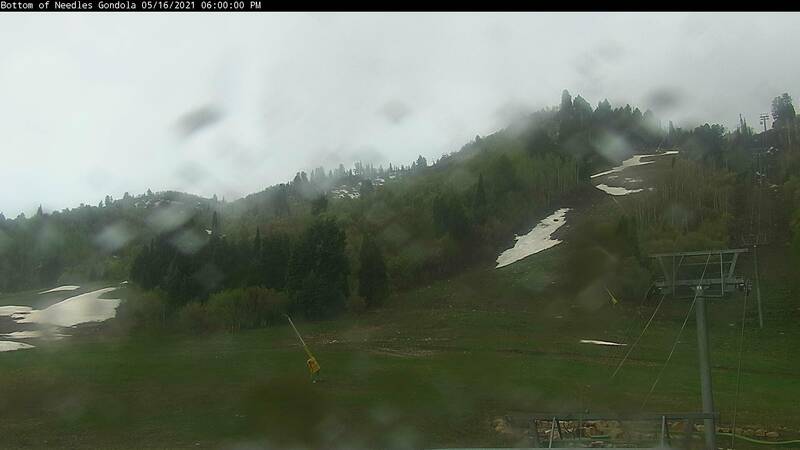 Snow Basin was the second ski area in Utah to have a lift installed with safety bars. At some point, I'm not sure when or why... the safety bars were removed. The Wildcat single chair lift stayed in operation and was used on the busier days. The Wildcat double chair lift was in service until the mid 1980's. When the double was open, we usually chose it over the triple because it hauled you up the hill faster. 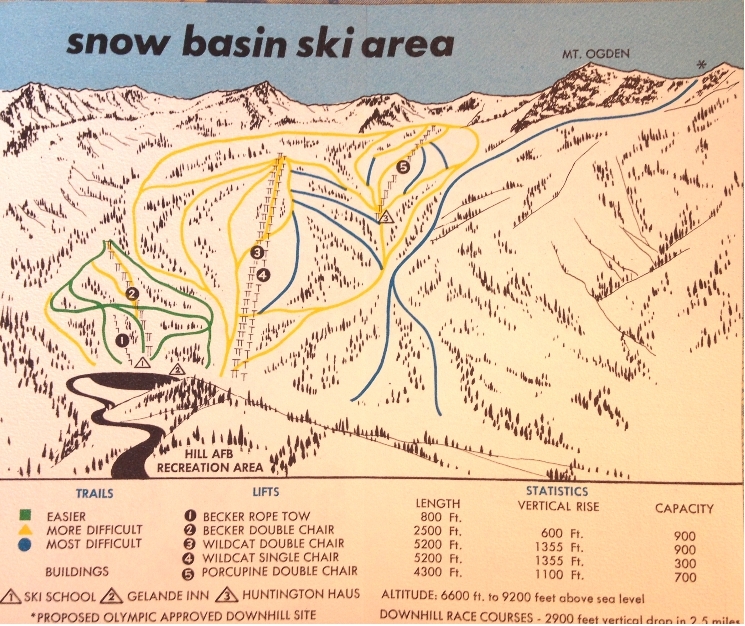 A new beginner area was cleared and a brand new Constam T-Bar was installed for the 1967-68 ski season. 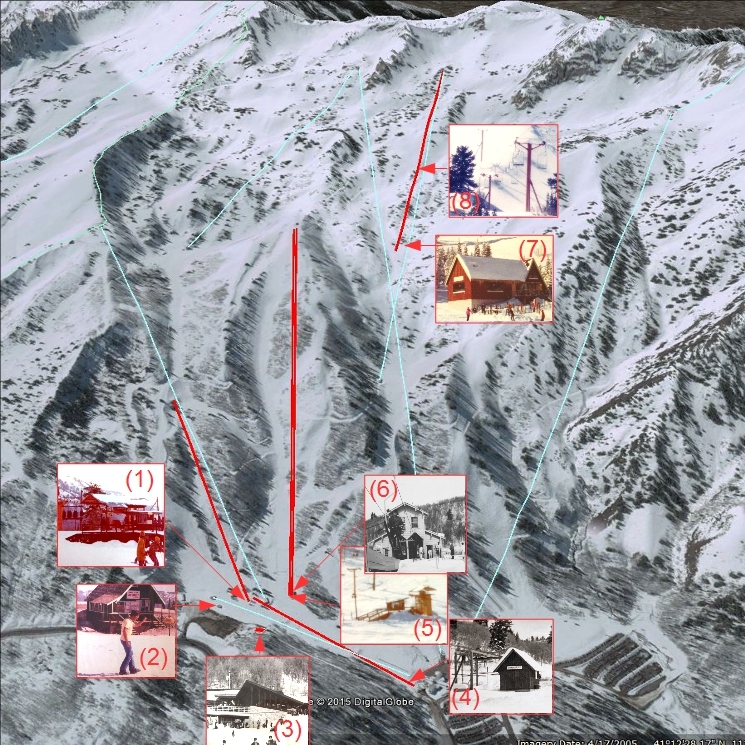 The T-Bar was 1800 feet long and towed 900 skiers per hour. 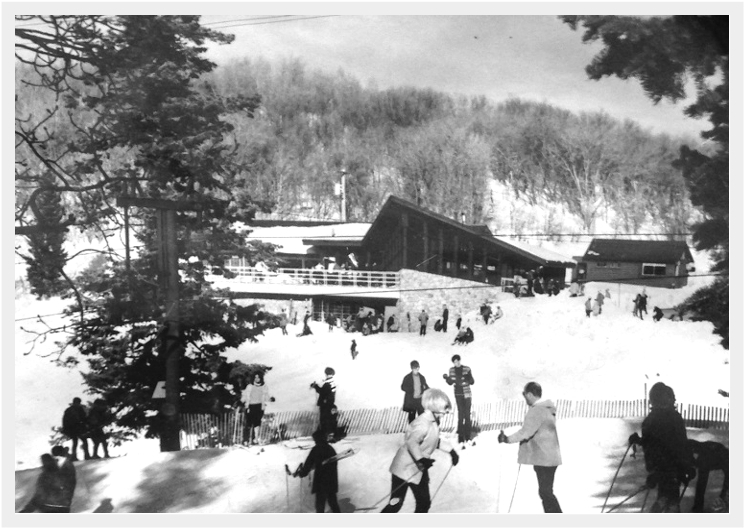 The T-bar was in operation until 1976 when it was replaced with the Littlecat double chair lift. I learned to ski one season after the T-Bar closed and from what I've heard I was pretty lucky to be able to ride the Littlecat double. Apparently the T-Bar was a bit unforgiving and at times was a wild ride (especially for a beginner). 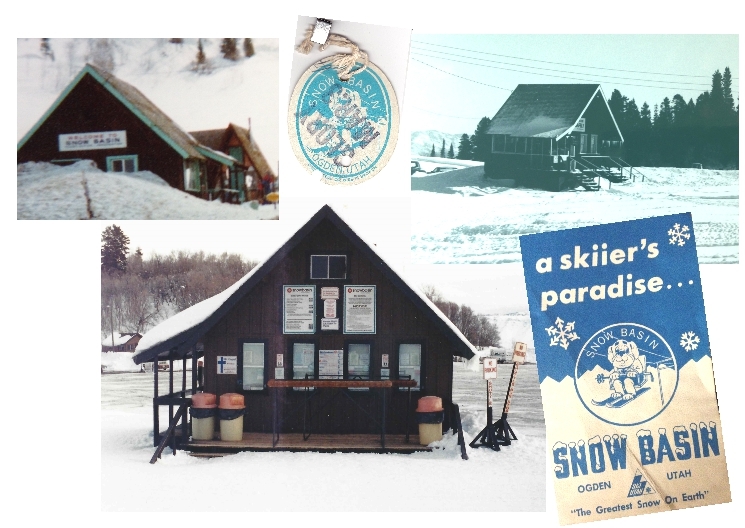 A new ticket office was constructed in the summer of 1969 to replace a small ticket stand that was located near The Earl Miller Ski School. The new building was also used as an administrative office. The ticket office was in service until the early 2000's. The building remained unused and was finally torn down along with the old ski school building in the summer of 2007 to make way for the Littlecat Express quad lift.